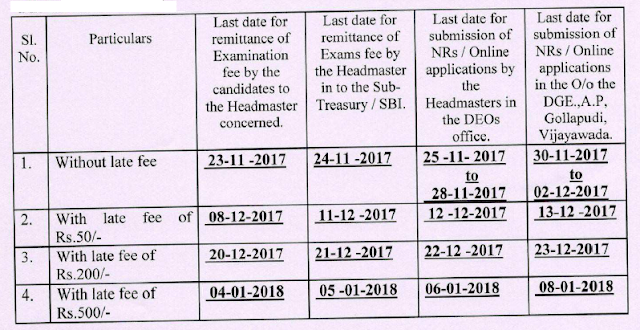 The following are the due dates for remittance of Examination fee for Regular/ Private Once failed candidates (Candidates failed in NEW PATTERN only) appearing for the SSC Public Examinations to be held in March. 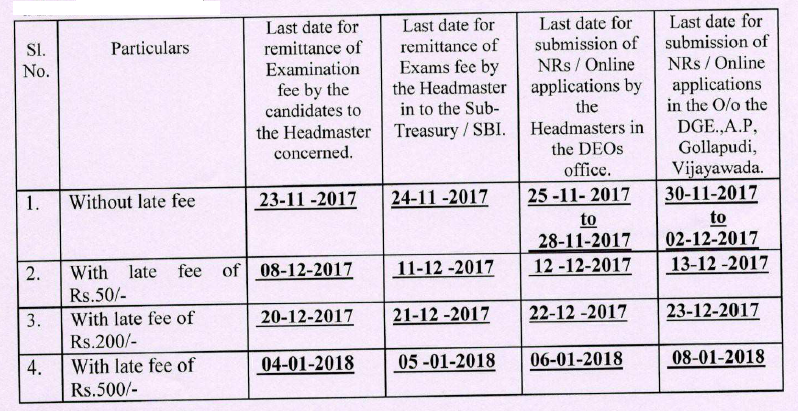 2018. heads of institutions of all recognized schools have to remit the fee in the prescribed Treasury Challan only enclosinga list of candidates to it. may be reckoned for the purpose. 5. Online Application link will be available in www.bseap.org. The applications of all the candidates shall be uploaded online without fail. 6. The candidates belonging to Scheduled Castes / Scheduled Tribes and Backward Classes who are appearing fur SSC March 2018 for the first time as Regular candidates and whose parental income does not exceed Rs.24,000/- per annual in urban areas and Rs.20,000/- or land holding not exceeding 2.5 Acres wet land / 5 acres dry land in Rural areas are exempted from the payment of examination fee. As such, (he Headmasters are requested to satisfy themselves about the Parental income by insisting upon a certificate issued by try manual Revenue Officer as pervrules.